A very special lifestyle development in the heart of the Catlins, one of the most ruggedly beautiful parts of New Zealand, has been launched onto the market. 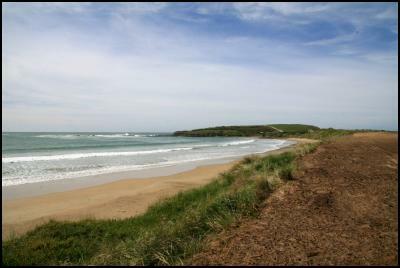 An exclusive sixteen-section subdivision at Porpoise Bay, where only a handful of houses dot a 4km sweep of golden sand, has come onto the market following extensive consultation to protect and enhance this area of outstanding natural beauty. The limited number of sites, three of which are designated as visitor accommodation and another as a café overlooking the bay, are in a totally unique location, all with stunning vistas. The café will seat up to 75 guests indoors and outdoors at any one time, with uninterrupted views of the beach and surf and easily accessible parking alongside. “We’ve been working on this project for six years and are delighted to get to the stage where earthworks were completed just before Christmas and the sections are now going to market,” said Porpoise Bay Ltd developer Wayne Foley. “It’s an unbelievably magical spot which attracts thousands of visitors each year but currently doesn’t have much in the way of accommodation, housing or visitor facilities. The sheltered bay is home to a pod of rare Hector’s dolphins, renowned for playing just metres from the surf, and within a few minutes’walk is Curio Bay, featuring one of the world’s finest fossil forests, remnants of a 180-million-year-old forest. Here the rare and much-loved Yellow-Eyed Penguins make their nightly progress from surf to land. The Catlins was recently named one of the world’s top emerging travel destinations by Travel + Leisure magazine, and the Southern Scenic Route one of the world’s great undiscovered drives. “We recognise that the area is absolutely unique because of its outstanding wildlife and natural landscape and appreciate that the development needs to blend in with that,” said Mr Foley. “That’s why we’ve taken utmost care to ensure outstanding quality in terms of the architecture of the café and accommodation and have strict design controls in place for those buying sections to ensure all buildings complement the environment. Sections range in size from 885sqm to 2,226sqm and are fully landscaped. Prices range from $195,000 to $345,000 including GST. Titles are expected to be issued in June 2009.